Frank “Frankie” James Edgar is an American mixed martial artist and former Lightweight Champion of the UFC. He currently competes in the Featherweight division. Born and raised in Toms River, New Jersey into a Italian-American family. Frankie wrestled at Toms River High School East and continued at Clarion University of Pennsylvania. In university he qualified for the nationals four years in a row. 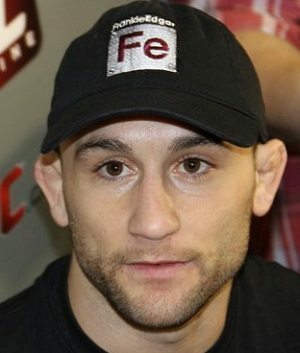 Frankie Edgar made his pro MMA debut UCL – Underground Combat League in 2005. Edgar won his first six professional fights before trying out for The Ultimate Fighter. He wasn’t selected to join the show, but impressed UFC President Dana White enough to offer him a fight against tough Tyson Griffin. 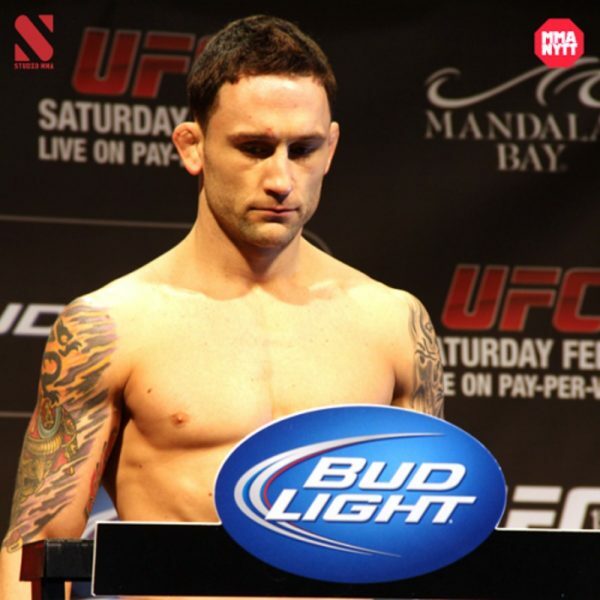 Frankie Edgar faced Griffin at UFC 67 – All or Nothing and won by unanimous decision. Griffin had Edgar in a deep knee bar at the end of the fight, but Edgar survived. He defeated two more foes before he fought the man who he would have an epic three fight series with; Gray “The Bully” Maynard. The first loss of Edgar’s career came after three rounds with Maynard. Frankie Edgar rebounded with three wins and ended up getting a shot at then lightweight champion B.J. “The Prodigy” Penn. Penn was dominating the lightweight division after winning the vacant belt against Joe “Daddy” Stevenson, and defending it three times against tough competition. Frankie Edgar came in as a huge underdog and shocked the world by winning a razor thin unanimous decision at UFC 112: Penn vs. Edgar in Abu Dhabi, United Arab Emirates. The rematch took place four months later and Edgar won a dominant unanimous decision to end the rivalry, at least at lightweight. For his second title defense, he rematched the first man to ever beat him, Gray Maynard. Maynard dropped Edgar multipe times in the first round, with the referee on the verge of stopping it for over a minute. Edgar battled back and in the end got a draw, and the rematch was scheduled 9 months later. The rubber match was similar to the second fight, with Maynard landing hard punches on the champion. Edgar won the fight by KO in the fourth round, winning Knockout of the Night honors. Frankie Edgars faced former WEC champion Benson “Smooth” Henderson on UFC 144 – Edgar vs. Henderson. He lost his belt that night by unanimous decision but got a Fight of the Night bonus. 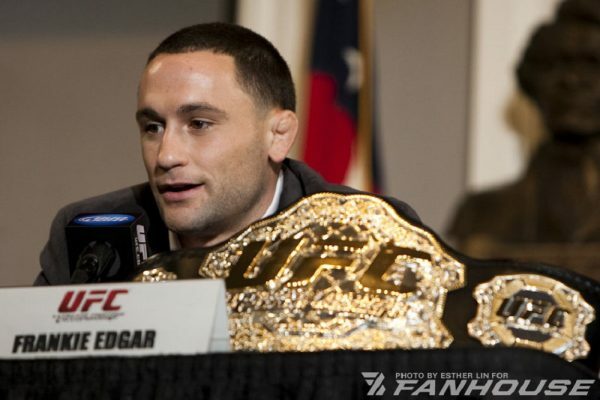 After a rematch with Henderson, Edgar moved down to the featherweight division. With the merit of being the lightweight champion, Edgar got a chance to fight for the featherweight belt against Jose Aldo at UFC 156 – Aldo vs. Edgar. Edgar lost a unanimous decision. Frankie rebounded with five straight wins against top competition like Urijah Faber, Cub Swanson, Chad Mendes, Charles Oliveira and B.J. Penn a third time. At UFC’s historical UFC 200 event he got another shot at to win the featherweight title, this time the interim title against Aldo. Aldo once again won a unanimous decision, this time way more dominant. Edgar rebounded with two straight wins against Jeremy “Lil’ Heathen” Stephens and Yair “El Pantera” Rodriguez. Frankie Edgar faces featherweight champion Max Holloway the 2nd of December at UFC 218.